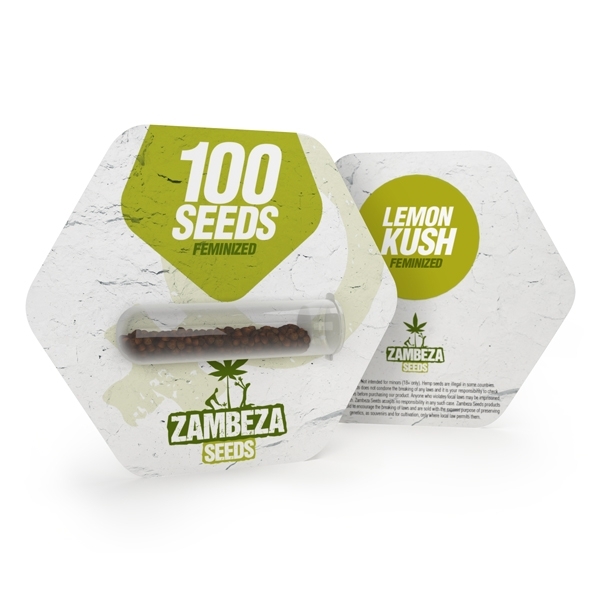 Zambeza Seeds crossed a Chemdawg, a Lemon Thai and a Pakistani Kush to create their Lemon Kush and the result couldn’t be a better example how at times diverse genetics can come together to form something exceptional. The superb potency, excellent taste, good yields and production of Lemon Kush easily outperform many other Kush strains available. Her stellar genetics make her easy to grow too! Zambeza did a fantastic job selecting diverse, yet perfectly matching genetics to make their Lemon Kush. The Chemdawg side of Lemon Kush with her high THC content is responsible for some spectacular potency, the Lemon Thai adds a hint of exotic spiciness and sativa characteristics and the Pakistani rounds everything nicely up with crazy resin production. Given her stellar genetics, Lemon Kush turned out a very manageable, easy to grow strain which makes her suitable also for new growers. When she grows, Lemon Kush may show more of her Pakistani indica heritage but there are also some sativa influences thanks to her Lemon Thai and Chemdawg parents. She shines with high yields of 450-500g/m² when grown indoors where she’ll grow to an average height of 100-130cm. Outdoors, if she gets plenty of sun, she can grow as tall as 230cm if you let her and this is where she’ll reward with high yields up to 550g per plant. When you smoke Lemon Kush, get ready for her awesome Kush-like body stone that is extremely relaxing but which thanks to her sativa side comes also with a cerebral head buzz that allows you stay focused. Her 18% of THC ensures a very potent and powerful smoke that will satisfy even the most experienced cannabis enthusiasts. Her awesome high is accompanied by a wonderfully complex taste, no surprise given her diverse genetics. She beautifully blends refreshing lemon notes with Diesel influences and spicy notes, making for an eclectic flavour profile that greatly harmonises. A feast for the palate that will delight every cannabis connoisseur! The spectacular mix of a Chemdawg, Thai and Pakistani makes Lemon Kush a Kush variety that’s absolutely worth growing no matter how you look at her. Everything comes together in perfect harmony which makes Lemon Kush a joy to grow and even more so when you smoke her! Lemon Kush bulk seeds available in packs of 100 seeds at Zambeza are a great choice for you to stock up on this fabulous Kush!